Alright! 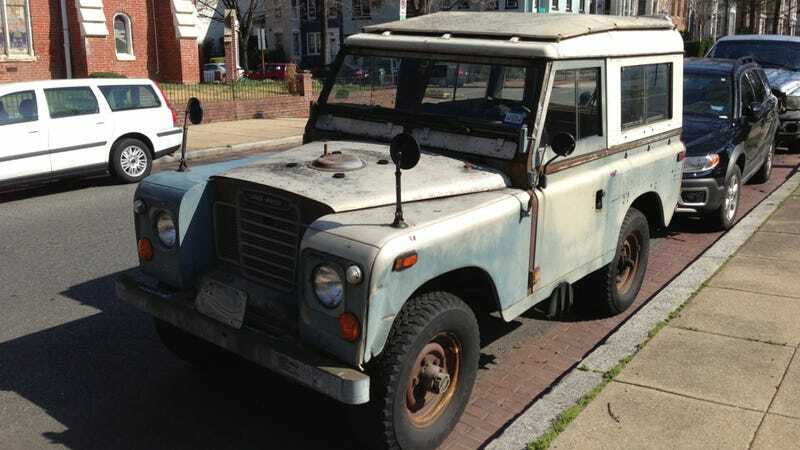 Now here's a tough old bird that's uniquely suited to the harsh urban environment that is the D.C. metro area: an old Land Rover Series III. I ran into this bad boy on a recent walk up near the Capitol. There was also a four-door Land Rover that appeared to be of the same vintage and an older Range Rover around the same block. I suppose we can assume they were owned by the same person. But this one was my favorite. Just look at this beast! They don't make SUVs like they used to. Heck, they don't even make Land Rovers like they used to — which would you rather take into the jungle, this or the Victoria Beckham-endorsed Evoque? The Series III I found wasn't in what I'd call decent shape. The paint is faded and it's coated in rust. It looks like it has hundreds of thousands of miles on it and has been taken into hell and back. I have no clue whether it runs or not. But look! It has a sticker that says "Save the Wilderness." From the looks of things, I'd say it's a safe bet this Land Rover has been there. As always, feel free to chime in if you know what year this one is. Do you have any great old Land Rover stories you'd like to share?